A superb functionality, a seamless supply of electricity and an intelligent design is what makes the V-Guard DU 3000 Synergy, a revolutionary product. It intelligently supplies all the electricity generated to the mains when the load is more but whenever the load is less, it stores the extra energy for use at the time of a power cut and will thus become your favourite in no time. It reduces the amount of energy coming from fossil fuels by supplying your operations with clean, renewable energy from the Sun. By providing more efficient energy and lasting longer than other brands, V-Guard Solar Power Systems are the best choice for cutting your carbon footprint down to size. The Maximum Power Point Tracking (MPPT) mode extracts maximum power from PV panels and the Four Stage Battery Charging Method prevents overcharging of the battery. All in all the V-Guard DU 3000 Synergy is a highly efficient device with MPPT technology which provides your appliances with seamless solar energy for a greener future. Its smart solar sharing working profile ensures that there is maximum utilization of solar energy and thus helps increasing Solar Power Generation. 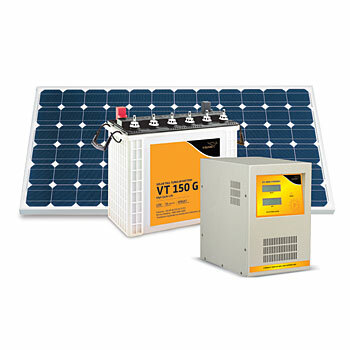 Just think of it as your solar power concierge and trust the V-Guard DU 3000 Synergy as your perfect solar help. It works in smooth harmony with your appliances and comes with intelligent charging algorithm, sine wave output and a microcontroller based design which helps you monitor all this with great ease.